On 14 January 2014, Vietnamese Minister of Planning and Investment Bui Quang Vinh presented a Medal of Honour, the nation’s highest official award for foreign nationals, to Prof. Finn Tarp, Director of the United Nations University World Institute for Development Economics Research (UNU-WIDER) and University of Copenhagen professor. In his speech, the Minister lauded Prof. Tarp for almost 15 years as the dynamic leader of a series of high-impact, policy-relevant research programmes focused on generating data, producing policy-relevant studies and building analytical capacity in Vietnam. Prof. Tarp has been a close research partner responsible for transferring international knowledge and skills in economic research to the Ministry of Planning and Investment’s (MPI’s) Central Institute of Economics Management (CIEM) and a number of other Vietnamese research institutions. Thanks to that support, CIEM, a leading Vietnamese economic policy think tank, has improved its capacity and competency in producing high-quality and evidence-based research and policy-oriented analyses. CIEM’s research work and policy recommendations have over the years proven instrumental in guiding economic planning and policy-making in Vietnam. Minister Bui Quang Vinh gives UNU-WIDER Director Finn Tarp his medal of honour. At the ceremony, Prof. Tarp expressed his sincere appreciation for the medal, noting that it recognizes both the value and importance that the Government of Vietnam puts on informing economic policy with concrete evidence, and the long-standing relationship which he, together with more than 30 international colleagues, has maintained with CIEM and numerous Vietnamese collaborators, senior researchers and policymakers. 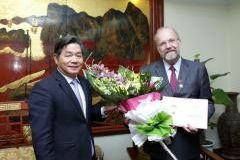 A medal of honour was also awarded to John Nielsen, Ambassador of Denmark to Vietnam. Minister Vinh stressed that Danish development cooperation has significantly contributed to socioeconomic development in Vietnam, and highlighted Amb. Nielsen’s significant contributions to the development of the planning and investment sector in Vietnam in addition to his instrumental role in facilitating the signing of the Comprehensive Partnership Agreement between Denmark and Vietnam. Both Amb. Nielsen and Prof. Tarp thanked the MPI for its recognition, saying that they would continue their efforts to enhance bilateral ties for Vietnam’s socio-economic development.